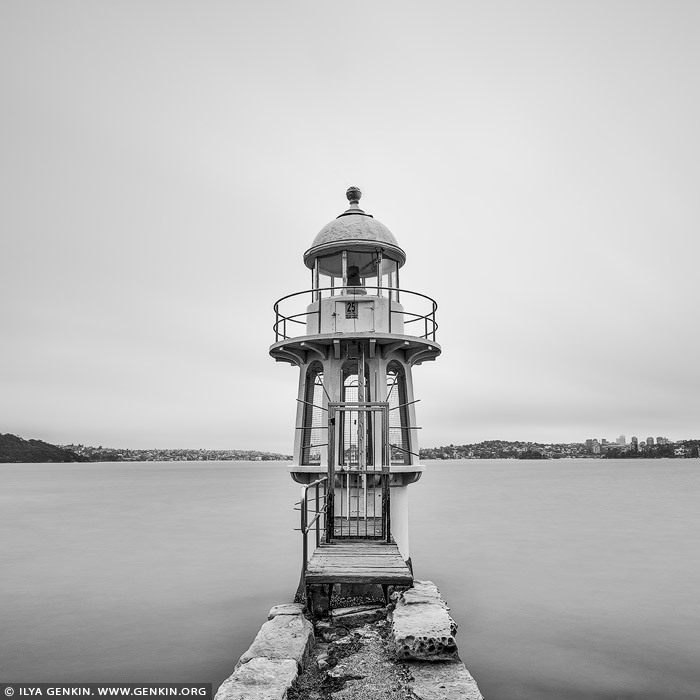 Robertson Point Light, also known as Cremorne Point Light, is an active lighthouse in Cremorne Point, a suburb on the lower North Shore of Sydney, New South Wales, Australia. At the very tip, visitors can wander down some old steps to the lighthouse, and the more adventurous can continue down a rather precarious ladder to the water's edge. The spectacular harbour views can be enjoyed from a number of bench seats. A memorial plaque reminds visitors to take extra care and respect the inherent dangers of the rocky coast. Built 1909 this light is of the same form and construction as the Bradley's Head lighthouse which was the first of this design to be erected. The Robertsons Point Lighthouse is of State significance as an integral component of the navigational system which ensures the safe operation of the Port of Sydney. It is an important harbour navigation light which is a minor landmark on the tip of Roberston Point. It is one of the early examples of the use of re-enforced concrete in maritime situations and uses both in-situ and pre-cast sections. This image belongs to the travel and nature stock photo library. This stock photo of Robertson's Point Lighthouse is available for licensing for commercial and editorial uses including websites, blogs, books, magazines, brochures and advertising. Restrictions may apply for images which contain third party copyrighted material or sensitive subjects. Photos of artwork are for editorial use only. This image id SYDNEY-IN-SQUARE-0010 of Robertson's Point Lighthouse, is copyrighted © by Ilya Genkin. This is not a public domain image.